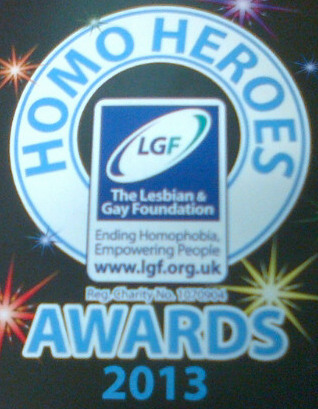 Fr Ian joined Bishop Nigel (former Bishop of Manchester) and about 300 other guests, yesterday at the 2013 Homo Heroes awards at the Raddison Blu Hotel in Manchester. It was a special occasion with a wonderful atmosphere and some surprises. Awards for those who have championed inclusivity and LGBT issues were given for businesses, social groups, public sector workers, individuals etc. Everyday people as well as distinguished people received acknowledgement, and everyone present heard some very moving and courageous accounts of work being done to combat homophobia and encourage an inclusive society, in the North West. Congratulations to all who won! Two surprises! 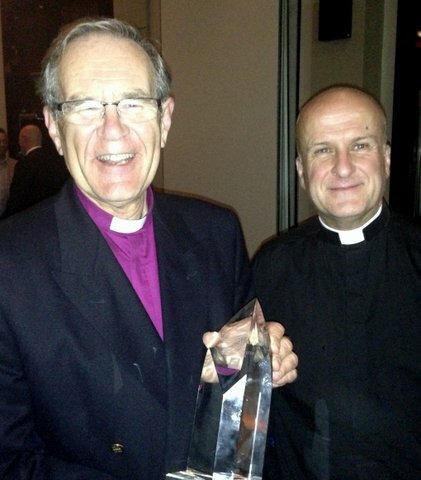 Bishop Nigel had been invited to give out the Community Champion of the Year award. At the end of the evening the Alan Turing Memorial award, for an individual or group that has made a difference for LGB people in Manchester, was announced. The citation was read carefully and no name was mentioned, we heard how the person had challenged homophobia in schools, in Manchester and its area, how the person had encouraged safe space for LGBT people* etc, as the list continued we finally realised it was Bishop Nigel himself. Congratulations to him! In accepting the award Bishop Nigel thanked the panel, and acknowledged the great progress that has been done in recent years while also saying more is to be done to ensure all people can give and receive love freely. It was poignant that an award named in honour of an outstanding scientist who rejected the church because of its attitude to gay people, should many years after Turing’s death be given to a Church of England bishop. Times have indeed changed. And the second surprise was a more spontaneous and embarrassing one, in addressing the gathering Bishop Nigel happened to mention it was Fr Ian’s birthday – and all the guests then spontaneously sang Happy Birthday to him! This entry was posted in Anglican, LGBT, Manchester, Uncategorized and tagged Bishop of Manchester, Homo Heroes, LGBT, LGF. Bookmark the permalink.